blog.HalloweenAdventure.com | Latest News from the Costumes Trend FrontLines! 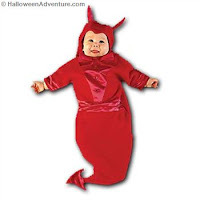 : The Best Baby Costumes! This Halloween, deck out your little one in our cutest of costumes. We’ve got outfits of all shapes, sizes and designs so that your baby is comfortable and cute on Halloween night. Baby Bee Bunting is what the buzz is about. 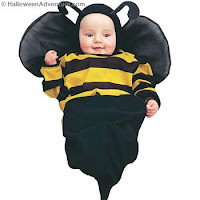 Adorable black and yellow on top, black on the bottom, black wings and a hooded antennae make baby's first costume too cute. Be careful! Don’t eat the baby! 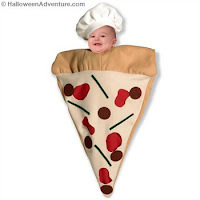 When you put your child in our Pizza Infant Costume, he’ll look good enough to eat J Two-piece costume includes bunting and chef's hat and fits most infants to 9 months average. Back Velcro closure. Douse your baby in gold with our Baby Fairy Fantasy Children’s Costume. 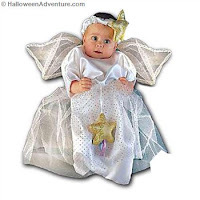 This adorable infant costume is a White bunting with Gold sparkle tulle wings & skirt, Gold soft sculpture star, and halo headband with Gold soft sculpture star. Hope you’re not afraid of spiders, cause our Baby Spider Costume is so adorable you wouldn’t be able to resist it! Includes a plush polyester grey and black vest with attached legs and spider, and a matching spider hat with antennas. Celebrate Batman with our Batman Bib Newborn Movie Costume. This one is a little bit batty and a lot bit cute. It includes a Batman bib and an attached black cape. Instead of giving him a new teddy bear, give him a teddy bear costume! 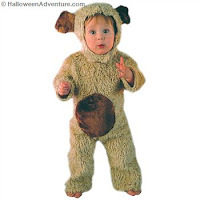 Our Bear Oatmeal Baby Costume is a comfy cozy option for the Halloween night. Includes: curly plush jumpsuit with plush faux fur tummy and separate hood with ears. Head over to Halloween Adventure ASAP and scoop up an adorable baby costume today! The best costumes sell out early, so hop to it!